Flying is great fun, but often involves a lot of paperwork. Whatever the need of your aviation business, we take the hassle out of flying with our 24/7 flight support services and web-based software and pilot apps. AeroPlus provides you with the software and the support to make the administrative process a breeze. Less work, less time, less costs and more fun flying. Our web-based enterprise resource planning (ERP) software is developed with the aviator in mind. Pilots, instructors and aircraft operator staff get a visual planning calendar: an easy way to get a quick overview of flights, flying lessons or business operations already scheduled and the availability of aircraft, pilots or instructors. Flight schools use our software to create and monitor training programs and the progress of students. Jet operators use the software to manage their human and aircraft resources, costs, schedule flights and invoice their clients. Aeroclubs run their entire operations from within our software. The role-based system guarantees that students, pilots, instructors, office staff and customers only see the information relevant to them and nothing more. The reason why so many aviation companies love to work with AeroPlus is because AeroPlus works in a web-browser and is thus easy to install and takes care of the complete primary business and financial process for you and your aviation business. This process includes resource planning and invoicing but also includes options to manage the aircraft maintenance, student pilot records and even provides pilots with a – pilot integrated briefing system – as well. 1 Prices ex. VAT where applicable as per 1-1-2017. Our Business Terms apply. AeroPlus Schedule is offered as a web-based software-as-a-service (SaaS) solution. AeroPlus Schedule runs in web-browsers such as Google Chrome, Safari or Firefox. You can change from one subscription type to another per the end of the month. You can cancel your subscription as per the end of each month as well. 2 For automated flight journal bookings and fleet tracking features, have a look here. 3 Free iOS app for iPhone | iPad available in the Apple AppStore. 4 Free flight plan filing for Schedule users using our flight plan app for iOS. 5 Support for online accounting system Exact Online. Available in The Netherlands, Belgium, France, Germany, the United Kingdom and the US. You need a separate Exact Online account. 7 24/7 Phone support for urgent matters. Other support through e-mail. The invoicing of flights can be done in several ways. Create an invoice on the spot when the pilot turns up at your counter. Alternatively, accumulate flight-costs and send weekly or monthly invoices to pilots or corporate customers using e.g. your jet service. Our software integrates with (online) accounting systems such as Exact Online, QuickBooks Accounting or Ciel! The Exact Online online accounting system provides full integration with AeroPlus and is available in the US, UK, France, Germany, Belgium and The Netherlands. Invoices generated in AeroPlus are send in real time to the online accounting system and the payments that come in through your bank account are visible within our aviation software within minutes. AeroPlus gives a clear overview to your pilots and customers of where they stand. Use AeroPlus to get and stay on top of your aviation business. The AeroPlus ERP system can be connected to the online accounting system Exact Online. 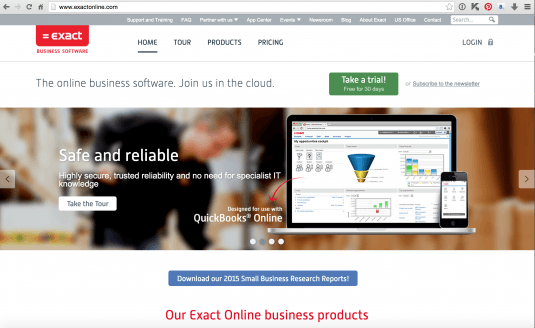 Exact Online is available in the US as well as in several European countries such as The Netherlands, Germany, the UK, France and Belgium. Complete integration between our software for aviation companies and Exact Online gives you full control of your flight and business operations. AeroPlus Tower is either installed on a single computer in the tower or FBO office. Alternatively, AeroPlus Tower is deployed in a networked environment ,where each staff member has his or her own role. Pilots pay per individual flight at the counter of the FBO or in the tower. Alternatively, costs can be accumulated to create compounded invoices, for example once per month. The embedded report generator produces the information you need to provide to the authorities. 1 Prices ex. VAT where applicable, invoiced per year. Our Business Terms apply. 2 The Runtime Edition needs no extra software and can be installed on a single Mac or Windows workstation. The Network Edition requires the installation of Filemaker on each client desktop and Filemaker Server on a central server. The licenses for Filemaker are not included in our subscription price. 3 Windows 7 or higher is supported. 4 MacOS X El Capitain or higher supported. 5 For a client-server configuration, you need desktops connected to each other in a network configuration with a server on which FileMaker Server is installed as part of that network.